One of the findings of our research is that some sterile plants attract a lot of bees and rank really well. Some of the reason they perform well is that they are the longest flowering plants in this study. The long flowering characteristic was presumably the plant breeders intention when they created them although I doubt they cared much about the benefit to bees. The specific nature of the sterility is that they have the ability to generate nectar but not seed. But these plants are apparently unaware they are sterile so they just keep generating more flowers in a futile attempt to reproduce. The result of this is that they continually flower for many more weeks than their fertile relatives. This also means a long flow of nectar for pollinating insects. It may be coincidence but this list includes plants that also extend the flowering season. 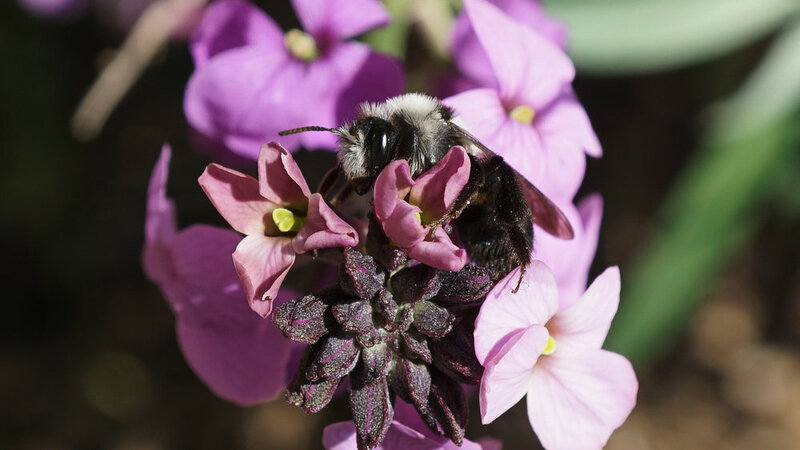 Erysimum ‘Bowles mauve’ starts flowering very early – sometimes in March providing nectar for emerging solitary bees. Helenium ‘Sahins’ early flowerer’ will repeat flower – at a low level - into September keeping the season going for bumblebee queens that have not yet gone into hibernation. However, the lack of seeds is not necessarily a good thing as they would be food for birds and small mammals.